THIS IS THE MOMENT A BASE JUMPER WHO LEAPT OFF A CLIFF HAD A MIRACLE ESCAPE AFTER HIS PARACHUTE OPENED BACKWARDS – AND HE FELL 1,000FT TO THE GROUND. Daredevil Matthew, 25, was travelling around the world taking part in extreme sports when he decided to go base jumping in Lake Garda, Italy. His previous 180 leaps have gone perfectly – but this time his parachute opened backwards and became twisted. He briefly floated before smashing into rocks and hurtled down the cliff face at speeds of 40mph. During the incredible incident on Matthew, who has been base jumping for three years, filmed the whole fall on his headcam. After bouncing down the cliff he landed at the bottom – and was just centimetres from death when a metal spike in the ground knocked his helmet off. He was found at the foot of the cliff in a crumpled mess but virtually unharmed except for minor injuries to his knees and ankle. He was rushed to hospital at 6pm on the day of the accident but was released at 1am the following morning and flew straight home. Matthew, who took up the sport after completing over 700 sky dives, recalled the horrifying moment he thought he was going to die. He said: “I prepared for the jump, everything felt really good. Then I performed a ‘track’, which means you are flying in a forwards direction. ”Everything was going fine and then I pulled the parachute. The problem was the deployment was really slow, it comes down to simple bad luck, nothing else, the conditions were fine, the parachute twisted and when it inflated it was facing backwards. “Due to the twists I couldn’t control it, I did the best I could with the situation and tried to avoid the cliff but I didn’t have the time or the space to avoid the impact. “When I impacted the first time I started spinning which made the situation worse, the parachute twisted even more before going into a dive and then spiralled towards the ground while I was smashing against the cliff. “I was trying to think about what to do, but all I could think about was trying to stay alive, I knew the final impact was coming soon and I knew if I hit the floor at the speed I was travelling, I was in a whole lot of trouble. “I managed to hang off one side of the canape and get away from the cliff but couldn’t control it still, I didn’t know if I was going to hit the floor or go into the lake. He added: “All I was shouting was ‘give me something’ it was like I was in a gladiator arena faced against ten guys and I was given just a spoon to fight with, I felt I was desperately fighting to stay alive. “I was trying everything I could to get some kind of control, then I looked down and saw around ten spikes which I believe were used to hang up wet suits. “At that point I thought I was going to die so the last thing I shouted was ‘I’m going in’ which means I’m dead. I was trying to tell the guys at the top of the cliff what was happening to me. “The spikes were around a foot long and there was ten of them, the one right in the middle brushed my face and went between my helmet and my face and ripped my helmet off, I think it cushioned my fall slightly. 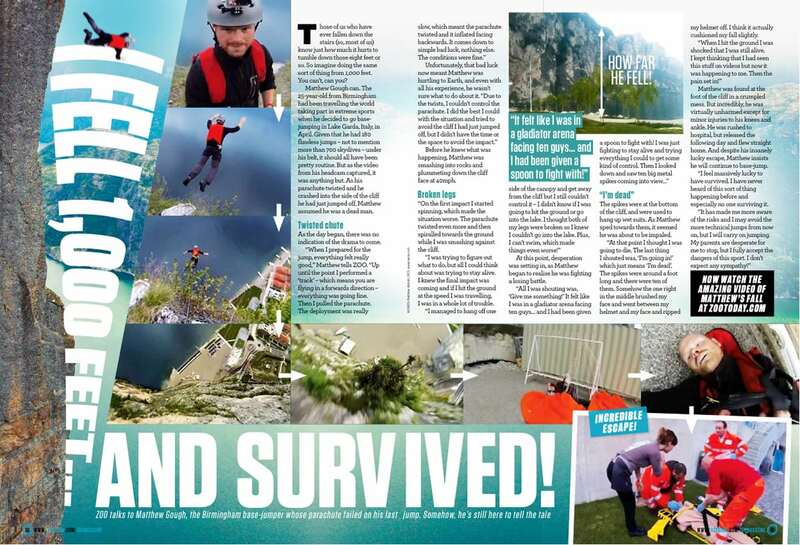 Matthew suffered the fall on April 23 as he travelled the world taking part in extreme sports. He used to work in sales and marketing but saved up enough money to travel and indulge his adrenaline-pumping hobbies. Since returning to the UK he has been seen by doctors who have examined minor injuries to his knees, coccyx and heel. Despite his fall, he insists he will still continue to base jump. He said: “I feel massively lucky to survive, I have never heard of this sort of thing happening before and especially no one surviving from it. “I am still going to base jump but it has made me more aware of the risks, I wouldn’t want this happening to me again and wouldn’t wish it one anyone else.